The Tenney Park lagoon, on Madison's near east side, is great for ice skating. The warming house was packed, but the lagoon is so big that two hockey games could be played while the rest of us could skate, or fall down, without worrying about being run over. The ice was a little rough in a couple of spots, but nothing that needed to be avoided. You can rent skates, check out hockey sticks, and the ice skating trainers that look like walkers too. Mon-Fri 2:00 p.m. - 9:30p.m. 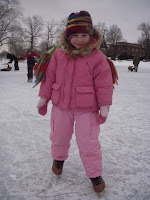 Sat-Sun 11:00 a.m. - 9:30 p.m.
Elver and Vilas parks also have ice skating and rentals in the warming shelter. Goodman, Garner, Olbrich, Warner, and Westmorland parks also have skating and warming shelters, but they don't rent skates according to the web site.